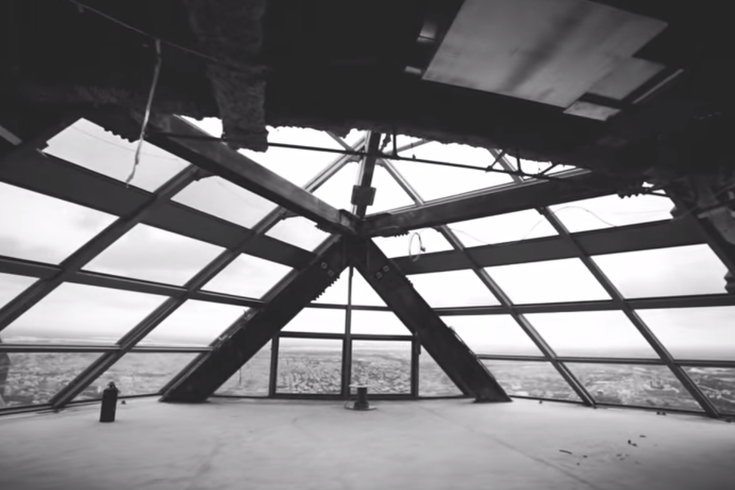 A look at the observation deck on the 57th floor of One Liberty. A virtual reality agency is creating an interactive touchscreen experience for the One Liberty observation deck, Philadelphia’s first public skyscraper deck set to open this fall. Portland, Oregon-based Panogs attached a robotic camera to the top of One Liberty Place’s spire that will snap thousands of high-resolution photographs for a 360-degree touchscreen map, technical.ly wrote. Panogs created a similar feature, called “Zoomable City,” for Seattle’s Space Needle. When visitors spot a landmark through the window, they can click on the map to zoom in and instantly learn more about the monuments they see from their sky-high perch. French company Montparnasse 56 is building the observation deck on the 57th floor of One Liberty Place. Tickets will be $14 for kids, $19 for adults. Four Philly favorites have volunteered to lend their expertise and write content for the map: sports radio host Mike Missanelli, DJ Cyndy Drue, mosaic artist Isaiah Zagar and Visit Philadelphia’s media relations guru Cara Schneider. However, the fact that only white people were selected to represent the city’s history has lead to some concern that the map will not reflect Philadelphia’s diversity. The board of the Asian-American Journalist Association cautioned that in a minority-majority city "voices of color shouldn't be left out." “The stories we read — or don’t read — about our city impact how we see ourselves, how we understand our place in Philadelphia and its history," the board wrote on its website. Liberty One’s general manager Evan Evans told AAJA that more content would be added, and more Philadelphians may participate. In response, AAJA has urged people to tweet #MoreVoicesOnDeck to @PhillyFromTop with their suggestions of Philadelphians who could contribute to the effort. Who would you nominate to bring on deck? Journalist Juliana Reyes has an idea.